This review is meant for those who have already seen Before Sunrise and Before Sunset. If you haven’t watched them yet, go do so before reading this review! Before Sunrise and Before Sunset perfectly encapsulated that idealistic feeling of finding true love. Before Midnight takes that notion and grounds it firmly in reality, showing what life is like ten years down the road. Surely a couple like Jesse (Ethan Hawke) and Celine (Julie Delpy) could be immune to the ups-and-downs of a long-term relationship, right? After all, so many of us fell in love with them as we watched them fall in love with each other. They seemed like such a perfect fit, and their back-and-forth dialogue felt so smooth and natural. Before Midnight shows us this couple, now living together for several years and proud parents of a set of beautiful twin girls. They are wrapping up a summer vacation in the beautiful countryside of Greece. Jesse has just dropped his son from a previous marriage off at the airport, reluctantly sending him back to Chicago to be with his mother. As it happens, Jesse is devastated at spending so much time away from his son, especially as he enters his formative high school years. The idea of moving to Chicago gets brought up in the middle of a normal conversation — Celine is immediately against the idea. She has the opportunity to take on a new job — her “dream job” as she later realizes — and she wants to stay in France. This discussion is kind of glossed over during a long car ride, but it comes up later, as is wont to do. This one little (but big) suggestion gets under her skin, festering beneath before sneaking out in the form of little jabs and potshots. Anyone who has been in a long-term relationship can immediately relate to the quibbles between the two of them, and quite frankly it can be difficult to watch Jesse and Celine spat back and forth. This is a couple that we have watched grow over the years in the most romantic way possible, and here they are middle-aged and bickering. It’s a stark reminder that no matter how a relationship starts, it takes some major work to see it through and keep that spark going. It’s not all melancholy in the film, however. There are several moments where we see glimpses of the couple as they were once before. A long scene at a Greek dinner party brings out some great stories, not just from them but also from their friends, both young and old. While the previous films rarely shined a light on anyone besides Jesse and Celine, here we are introduced to a handful of other characters, all of whom are interesting in their own right. It’s actually kind of refreshing to watch them banter with other people, especially given that their one-on-one conversations this time are a lot less pleasant. But that’s the beauty of this film. Before Midnight feels entirely believable, even moreso than before. Hawke and Delpy still have flawless chemistry together, and as it goes with most Linklater films, the writing is excellent. While part of me is upset that I had to see Jesse and Celine this way, I am infinitely grateful to have experienced another 90+ minutes with them all the same. Great review Eric. Not seen a negative word about this yet. Can’t wait to check it out and so glad it’s a worthy follow up to the other two. Thanks. In some ways, this one may even be the best yet. Nice review. I haven’t heard a bad thing about Before Midnight so far and I’m hoping to catch it this weekend. Awesome. Did you get a chance to check out the first two yet? I saw the first one and it’s pretty amazing. I hope to see the second one soon. Nice! I think the second one is my favorite, though it is hard to choose. One of these days I’ll get around to watching this one for the Readers Recommend series, Eric. Skipped the review for now, but I’m glad to see you think so highly of it as to give it one of your best grades! Lovely review! I’m a big fan of previous two movies so I can’t wait to see this one. Thanks! This one won’t disappoint. Unfortunately haven’t seen any of the films in this trilogy, but with all the hype surrounding this new one, I’ve added the first two to my Netflix queue. I didn’t see the first two until last summer, and they quickly became two of my favorite movies. Hope you enjoy them. Happy to see the praise continuing here. Great write-up. Thanks man. Enjoyed your review as well. Though the film has a melancholy undertone, I thought it was the funniest of the films. I completely identified w/ the hotel room scene. I’ve lived that scene. Oh, you’re absolutely right about it being the funniest of the three films. Great call on that. I thought the dinner scene had some especially amusing bits. Great review Eric. Really glad you enjoyed this film. I agree with you, the films of this series feel so real, and Midnight might be the most… I dunno, accurate one yet. Beautiful and real, all the way. Thanks man. I know exactly what you mean, and its that sense of authenticity that keeps drawing me in. Hell of a job by Linklater, Hawke and Delpy. Favorite of the year so far, and probably will still rank up there if something doesn’t take me over in the next couple months. You never know with the way this year’s been turning out. Nice review man. It’s my favorite of the year as well. Thanks, Dan. I feel like I’ve grown up with these characters. Another very positive review for Before Midnight makes me happy 🙂 Can’t wait to see it! How would you rank the trilogy? Oh man, that’s an impossible question. 😀 All three of ’em are at least 9/10 in my book. If I haaaad to choose, I would probably go with Before Sunset. Loved that ending. Reblogueó esto en You Are Writer. I couldn’t agree more! 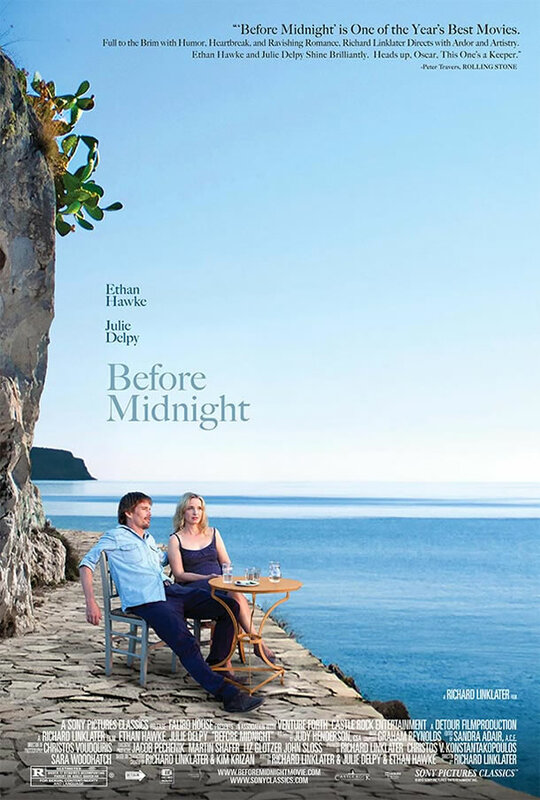 Before Midnight is one of the most enjoyable movies I’ve watched in a long time. Awesome! So glad to hear you’re a fan as well. Oh man, I cannot wait to see this. Great job! These movies are so smart, funny, and filled with such great romantic chemistry that you just can’t help but be charmed by them. And all that normally happens is just two people walking and talking… In a world of movies filled with quick cuts and short choppy dialogue, it is a rare and refreshing treat to be able to sit back and enjoy a great conversational piece like this… its almost like going to an opera of oratory.. I plan on reviewing all three soon after I finally get to check out Before Midnight…. Well said. There aren’t many films that even attempt to pull something like this off these days, but Hawke & Delpy make everything feel so natural. Great to hear this film is living up to expectation. It is one of my most anticipated movies of the year. It will be worth the wait. Hope you enjoy it as much as I did! Skimmed over the review as I don’t want to possibly spoil it but 9/10 has got me excited! I liked without truly loving Surnise and Sunset, so am hoping this one is the best. This one feels the most “authentic” of the three. Will keep an eye out for your review! Well said — there’s definitely still love between them even amidst the bickering. I think the second film is my favorite as well, but each one is near perfect on its own. Such a great series. Happy to see you enjoyed this movie. Which is your favorite out of the trilogy? That’s a tough call! I think I might be partial to Before Sunset, simply because I loved its ending the most. How about you?